Or: Skip The Blah-Blah. Downloads At The End. I know this isn’t new. I’m not the first person to ask a class to make an x-y graph out of some ripped-from-real-life event. This idea that we can describe things that happen with mathematical graphs isn’t new, nor is the idea that this is an effective introduction to a linear unit. I’m not saying that. What I’m saying is that it’s never been done this well. I went out and taped ten events. They were simple. I walked down two flights of stairs. I ran up a hill. I drove my car. Each event was exactly fifteen seconds long. I put a handout on every student’s desk with a graph ready for each event. The students started scrawling approximations of my movement and realized quickly that they couldn’t remember when I hit the next flight of stairs (was it after four seconds? five?!) and, consequently, couldn’t finish their graphs. But I pressed play again and the same event played out, only at half speed. I embedded chapter markers throughout the DVD (by the way, it’s a DVD) so that I could replay that slow motion footage as many times as they needed. All this time I walked from desk to desk, stamping graphs I liked. Once we were all discussed-up and done with our graphs, I hit play for the last time. 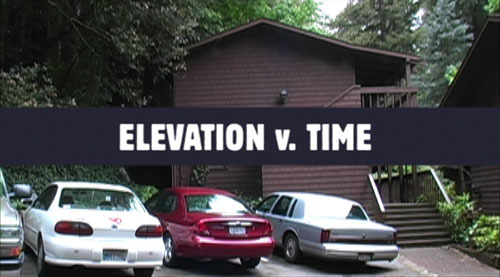 The footage played out at full speed and — I’ve got to pause here for some kind of effect — the event graphed itself above the footage. The total effect only intensified and grew more exciting with each new event. With scaffolding that precise and a visual connection that strong, even my weakest students were drawing eerily accurate graphs. They grew fanatical about accuracy, asking me to replay the footage five times for one particular event. Some became ornery when I couldn’t come and check out their productions. There are a lot of good ways to start a linear unit, I realize, but this felt like Shaq set a screen and sent me flying down the court. The progression through the unit is obvious to me now and we’ve been murdering the material in the days since this lesson. I used Photoshop and Motion for the graph work. Final Cut Pro to sequence things up and DVD Studio Pro for the pretty menu. In the pantheon of paid video projects I’ve completed this year, this forty-five minute math lesson holds its own and I’d like to put it your hands. If you’re all about the love, be a friend and link this post from your blog. I’ll send out 20 DVDs to the first 20 bloggers who link this up and send a mailing address to dan at mrmeyer dot com. Even if you aren’t of the mathematical persuasion, consider pointing to this post as a model of What Could Be if we’re all pooling resources. 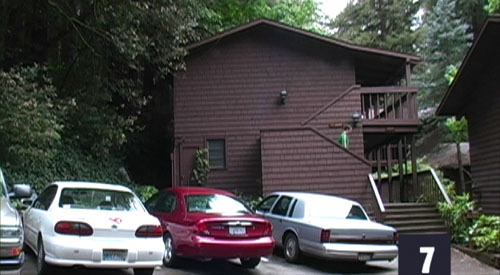 2012 Dec 11. Please check out GraphingStories.com, which is an updated catalog of graphing stories. Wow, I’m impressed, and I’m itching for a reason to use my new DVD burner. Does Disk Utility work fine for it? Hope you don’t get screwed on your bandwidth bill. Good work Dan, this looks like a brilliant way to link real-world activity to theoretical knowledge. Thanks for the feedback so far. If anybody’s got any fun ideas for future volumes — events that are filmable and graphable in fifteen seconds — drop ’em here. Steve, yeah, that’s the largest file I’ve ever served up but unless this takes off like LonelyGirl, my allotment can handle it. I tried to seed a Torrent but that didn’t work out. Darren, sure, twittering’s cool. Don’t forget to send a mailing address to collect. I’d like to get you a copy. Same goes for Paul, Rick, and Steve Dembo of Teach42. If you ever put your lessons on a dvd for sale, I will be first in line. I know technology, but you leave me in awe and in the dust! Have you used the TI-8x calculators with the sonic motion detector? 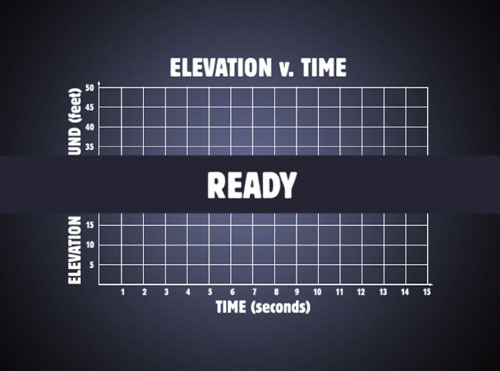 It gives a great graph of distance vs. time and I have had great discussions with students about being able to graph “vertical” lines (impossible in time/dist graphs unless my students develop the ability to stop time, in which case I’m running for my friggin’ life…) that lead in to talking about 0-slope v. no-slope. Having students try and match graphs that are given by “walking” the graph in front of the detector is a great activity as well. Also, as you present the movies (great job again BTW), maybe have students graph their guesses on the whiteboard over the movie (I always show video/websites/etc directly on the whiteboard as opposed to a screen…much easier to add comments). Then play the event graph. OK, done. Is the number of requests above 20 yet? Nah we’re at, like, seven maybe. And I’ve got more trackbacks than people sending me mailing addresses. That’ll be a challenge for me, but I’m up for it. Tweb, good call on having them draw it on the board in advance of the finale. I project on a whiteboard also but I should’ve thought of that one. As for the TI motion sensors, those are fine machines. My credential advisor had one I used (in pretty much the exact same way you did) during my preservice year but, past that, they’ve been a memory. *sigh* A really nice memory. Great use of media in a math lesson! I’ll forward this on to the math teachers at my school as well. I think your approach to both teaching, and to sharing of resources is right on. Your idea of “What Could Be” is something that we should be sinking some more thought-hours into. B – given a graph with labeled axis, students work in pairs to invent a scenario that would result in the given graph. C – Students invent their own 15 sec. action, make a graph, write a description. C part 2 Students act out their action for others to graph. I always say if its good enough for me to do, it is even better for them to do. 1. Foul Line (height vs. time) – Basketball free throw timed from leaving the hands to the time it stops bouncing on the floor. It’s probably a good idea that you make the shot for self-respect. 2. Marshmallow Melt (height vs. time) Put a marshmallow in the microwave for 15 seconds. As a style bonus, you can frame the shot using the microwave’s counter to represent time, or use some Peeps instead of regular mallows. 3. Beginner Level-Minesweeper (mines flagged vs. time) ) Any half-way decent player should be able to clear this level in 15 seconds. Of course, this isn’t a continuous function as I have stated it, but you could easily define parameters to turn it into a step function. 4. Toilet Flush (water level vs. time) timed from initial flush to the time the bowl is refilled. Might be a tough camera angle, though. 5. Balloon Burst (surface area vs. time or volume vs. time) Use an air compressor or helium tank with a valve to control speed. This one will require some calculation before the graphing can begin. Extra points if you can get the balloon to burst exactly at 15 seconds. Just a few ideas. I don’t know if they’re what you’re looking for. Robert, I did both parts of C with my kids the day you stopped by. Lots of fun. I didn’t try out B, which of course seems crushingly obvious now. Bummer. Making a note for next year. Tony, pondering math while waiting in line for the Spider-Man premiere? Heh. I think I’m getting a clearer picture now of the kinda cat we’re dealing with. Nevertheless, love the balloon burst suggestion. That’ll be a fun one to shoot. Wonderful! I remember an old Sunburst program from the mid-80s called Interpreting Graphs. The kids had to match a graph to a described action/story. There were things like a bathtub filling up with water and then draining, people standing at a bus stop as x number of buses came. 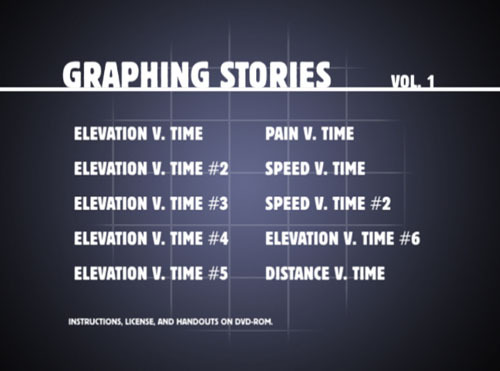 These are events that take longer than 15 seconds — so *showing* them as movies might not be time efficient, but I like the idea of asking kids to match graphs to stories. It even works as a multiple choice, if you like to occasionally give kids work in a format they need to be familiar with for testing. Hey Dan, I just finished burning the DVD iso and gave it to the math dept head. This is right in line with their curriculum, so here’s hoping they love it! Chris, nice. I wasn’t exactly sure of the best way to share a DVD online and even less sure about this whole iso set-up. Glad the process worked out. Kristin, thanks for the write-up. Be sure to toss me a mailing address (dan at mrmeyer dot com) ’cause there are still eight DVDs left. Everybody else: still got eight DVDs left. Vicki, Sunburst does great work with linears, that program you mention being another sturdy horse in their stable. What I found through this lesson, though, is that the status quo (talking about a bathtub filling up with water, having our students graph it, and then saying, yeah, kids, you got it right) doesn’t have a tenth of the reinforcing, connective, multi-modal power as did actuallly showing the event and the graph in tandem, in full color. I knew this lesson would make a stronger appeal to my visual learners than the status quo but I didn’t predict this. And good idea with multiple choice graphs. I think I’ll try that out next go-around. What with all the suggestions floating through here I feel like by next year I oughtta have a comprehensive Linear Unit DVD. Handouts, lesson plans, video to go straight through. That’d be intense. Oh, I wasn’t suggesting the software over what you are doing at all. More as a sort of complementary activity, and one that can be worked into paper-only activities for homework or for people who don’t always have access to technology. I love the live, right now action and what a graph of that looks like. It really brings alive the idea of graphing time. We are working right now developing a curriculum for a “infomatics”/tech learning skills class for 9th graders, and graphing will be a huge part of it, especially figuring out what kinds of graphs suit different types of data. I just sent the link to this entry to the teacher who will be teaching it. Thanks for posting the link to the DVD – I downloaded it and it works well (the pdf of the worksheet was a nice touch). Keep blogging – your posts remind me to continue to ask myself the important questions. The “D.I.Y. Math Film Festival” that allows teachers — and also kids (the missing link? he smiles) — to create their own short videos demonstrating “math in the world” with a focus on their ability to simultaneously frame an exercise, posit a question, or connect the dots academically. Even better if strong presentation and design skills are employed in the process, n’est-ce pas? Seems that with a small amount of time/energy, you could create an aggregation site where the film festival would host the videos, attach relevant curriculum or links, foster relationships between teachers and kids, and in general merge 2 obvious loves you have — design/video and math — to serve an even larger love you have — kids/teachers. People have clearly been drawn in by the graphing videos you’ve done. Obviously your kids have, too. Next step, next year: challenge your kids to develop short videos of their own showing graph relationships (amongst other math concepts), upload them to YouTube or GoogleVideo (or whatever), while simultaneously offereing teachers through your blog a chance to do the same as professionals and novice film-makers and to bring their kids into it as well, and then aggregrate them into one site or a site with links, and open up your first D.I.Y. Math Film Festival. Will be one of the great School 2.0 (he smiles) stories of the year when the curtain opens. Also a good representation of the “calcification of history” and core fundamentals of teaching that you so appropriately protect. I had already resolved to take student entries next year but your Internet extension does me, like, ten orders of magnitude better. I hope this mini-YouTube content aggregater I’ve got in my head is as hassle-free to set up as I’m imagining. Could be really fun. People like you make me want to quit teaching. How do you have time for it all and stay passionate? I’ve just started playing with web 2.0 and I made some Keynotes for Geometry and Pre-Calc, but nothing like this. Any tips would be much appreciated. Tanks. Burning up time on projects like these keeps me passionate, actually. And I try really hard never to burn up time on something I can’t use again. Your blog said PowerPoint but you’re playing with Keynote? That’s really good news for your Geometry students. If you’ve got a sec, check out the scattered Keynote Geometry lessons I’ve posted. The ability to project visuals onto a smart board is gonna pay you back huge this year. A nice addition could be a clip of you standing still, tapping your watch, generating a horizontal distance v. time graph. Oh, yeah. Good idea. That’s a good one. Next year definitely. I mean this year. Sometimes I think it’s summer still. Where can I purchase the DVD? I used this with 5th graders and it was AMAZING!!!!!! Always glad to hear that. The DVD isn’t for sale, unfortunately. I can arrange a copy, though. Just get me your mailing address in the contact form above. Dan, I’m loving your blog. You have so many great ideas. I can hardly wait to implement them! Three different classes this morning, three different reactions. The thing that worked best for me happened in the last period. One student was in charge of putting the graph on the board (and she behaves better there, so it works great for me). She asked to go to the bathroom between videos and I let her. She returned in time to draw the next graph based only on what other students said. I think it removed some of the pressure from her to be perfect; I know it put more pressure on the other students to decide what happened. When we watched it again I got the classic, “You missed that,” from her. That made my day. So my addition is to do blind draws. Break into groups with one member who’s drawing without watching. See what the other students describe to them. Some great ideas for graphing exercises. 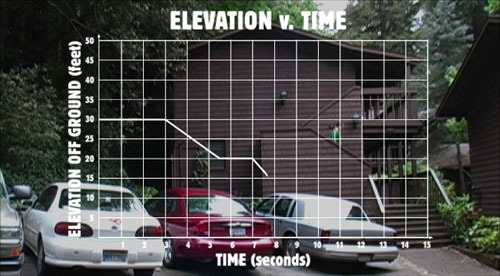 I made four graphing exercises using videos and my Smart Science(R) technology (www.smartscience.net). The first one is just someone walking, jogging, skateboarding, and biking. My goal is to associate speed in a distance-time graph with slope. The second used a person walking and then changing speed once. We have increase, decrease, stop, and turnaround. Because I’m not the teacher, I can only recommend that teachers ask students to draw the graphs they expect to see beforehand. By clicking on the person in each frame, students take the data and see it graphed in real time. The third was filling graduated cylinders with equal aliquots of water (with coloring added). The graph tallies with cross-sectional area of cylinder, not diameter. Students are supposed to analyze the data to figure that out. The fourth was a spring scale with weights being added. All four use click-to-collect-data technology. I’d love to add a balloon expanding with steady inflow of gas. It’s not strictly a diameter being proportional to third root of time because of compression of gas as balloon gets larger. Making a histogram of balloon bursting times when using a large number of “identical” balloons opens up all sorts of investigations and uses a different sort of graph. Thank you so much for all the hard work that went into creating this lesson. I am currently teaching summer school for students entering the ninth grade. I used your lesson today and had tremendous results! If you have any other ideas, I would love to hear them. Pingback: dy/dan » Blog Archive » Awards Hysteria! Pingback: Math Bloggers Hall of Fame « Let’s play math! Pingback: Dear Dan, « Questions? Pingback: Divide By Zero » Blog Archive » Right Strategy, Wrong Time.